When I was approached to be the guest on Just the Bottle we talked through a few ideas of what the theme would be. I had recently done two Spanish wine and Spanish cheese pairings, (http://wineandcheesefriday.com/rioja-with-sheep-cheese-a-little-piece-of-spain/ and http://wineandcheesefriday.com/white-rioja-and-goat-cheese-log/) that were well matched, so I suggested the idea. Christina, the hostess, happily agreed since she is a fan of Spanish wines. This was our chance to get better acquainted with a new region for wine and cheese. 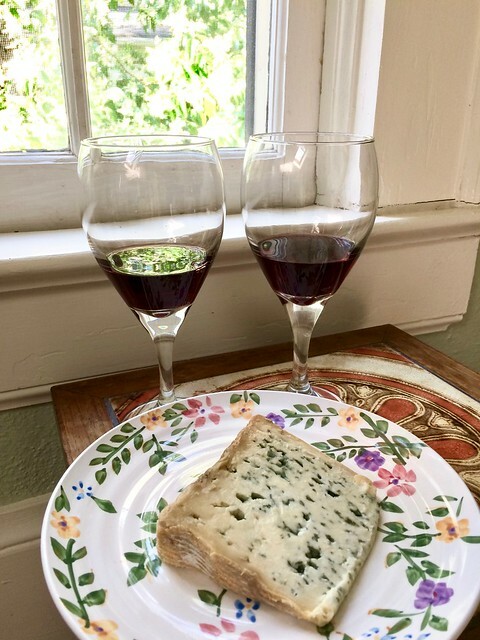 We’ve had Grenache from California and quite a few blue cheeses but neither one from Spain so when we came up with the idea of Garnacha and Valdeon, it was settled. The date of the #winechat with Just the Bottle coincided with Wine And Cheese Day, don’t you know. What a fun plan! In order to ensure we could find the wine and cheese we wanted, we scooped them up as soon as we could and did the pairing. We took a bunch of photos and countless notes in order to cover all our bases for the chat. As the date got closer we finalized the theme of the chat and what we planned to discuss. Being new to this region for Wine And Cheese, I studied up so I’d be ready. I found out there’s a website called Catavino, that was so helpful to get my introduction. I pre-answered my questions in the allotted number of characters for Twitter and waited for the chat to begin at 9pm. 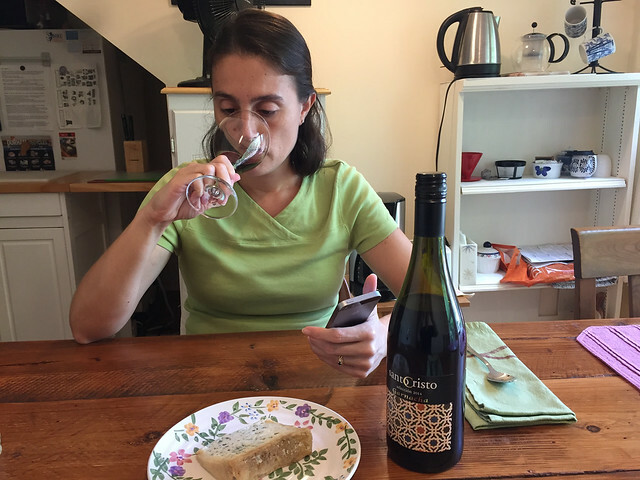 This chat was a little different than my previous guest appearance on #WiningHourChat, about six weeks ago, http://wineandcheesefriday.com/a-behind-the-scenes-look-at-a-twitter-chat-wineandcheesefriday-is-featured-on-wininghourchat/. Instead of giving me exact times that the questions would appear, we just had a list of ten questions to pull from. This made it a little easier for Neil and I to not have to fool around with alarms going off through the evening. The other side of that though, was that after only 5 questions, it was already 945pm. It was a much more relaxed environment than last time. Although it was “easier”, there was still a good amount of back and forth with questions from the hostess and the audience. Another difference with this chat was that quite a few pairing suggestions came up for us to try in future entries. I happily recorded those so we can continue discovering the regions in Spain. In case you were wondering about the questions we discussed, here’s the list, complete with the answers. Q – Maria, which is your first love – wine or cheese? A- I’ve always enjoyed eating cheese but it wasn’t until we started the blog back in ’13 that I found out how cool it was to pair wine & cheese. Q – What’s a common misconception of wine and cheese pairings? A- There’s a lot of people that will tell you that it’s easier to pair white wine with cheese but it totally works to pair red wine and cheese too. It’s all about what you like! 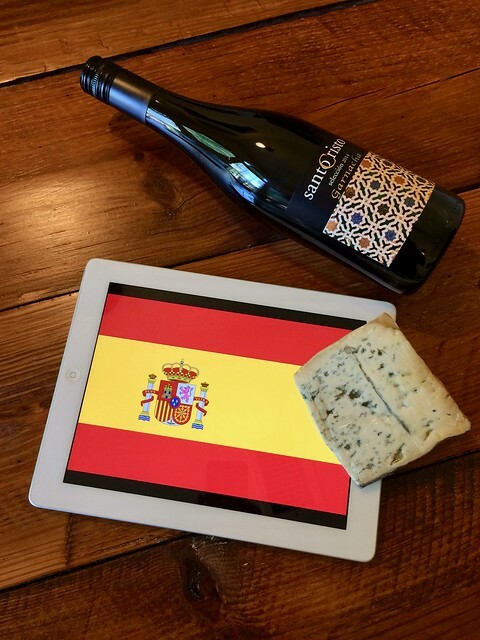 Q – What’s your favorite Spanish wine and cheese pairing? A- We’ve actually only done a few Spanish Pairings on the blog but it was a huge improvement once I discovered there were other grapes in Spain besides Tempranillo! Learning some of the grapes of the region really helped get us excited about Spain. A-Garnacha y Valdeon. We chose the Garnacha because I’ve had Grenache before but never from Spain. The Valdeon is a blue cheese and the first I’ve ever found from Spain. Let the education begin! Q – Why choose Spanish cheeses over other countries? A-I like a hard cheese that has some funk to it. Many of the cheeses that we’ve tried from Spain are aged and have either Sheep or Goat’s milk and the funk and complexity that we are looking for in a cheese. Q – Which cheese and wine pairing from Spain excites you the most? A- Back in the Spring, we tried both a red Rioja with sheep cheese and a white Rioja with goat cheese. It was fun to learn about the different aging requirements for Rioja wines and that there were both red and white wines made under the Rioja name. Q – What’s one wine and cheese pairing that you felt would be perfect and failed? Why? A- We paired a red blend that had notes of black pepper with a cheese encrusted with black pepper but when we tasted the cheese, it really didn’t taste like black pepper. It really took time for the black pepper in the cheese to build up. Want to know more? Search the hashtag winechat on Twitter to read the entire chat. #WineChat occurs on the last Wednesday of every month at 9pm (eastern time). Why not check it out sometime? Some of you may be wondering how our Spanish wine and cheese pairing worked out? Don’t worry, it’s time for that now. Between Neil and I, we noticed quite a few aromas in the Garnacha wine. I found a nice mix of berry and spice, red and dark fruit but then a strange aroma of permanent marker that may have just been alcohol. Neil picked up pepper, cassis and a musty wine cellar. As we tasted the wine, there were many flavors too. I tasted blackberry and prune, felt it was warm and dry but also spicy. Neil identified pepper, dark fruit and cassis flavors as well as calling it dry, musty and funky. It was definitely interesting! When we purchased the Valdeon, the cheesemonger said “When it’s cold it will crumble but when its warm you can spread it.” How versatile! For our tasting, we ate it at room temperature. Similar to the wine, this cheese was pretty complex! As I smelled the cheese, I picked up the pungent blue funk in addition to the salt and acidic aromas. Neil found a strong barnyard funk aroma that reminded him of penicillin and fall hay. I called this cheese “Tasty!” after identifying salt, milk, and butter flavors. The texture was soft and smooth, not crunchy, such a pleasant, not funky, blue cheese. Neil agreed that it was a “Very good blue!” It was nice and soft, rich, and very balanced. The rind was flavorful and the cheese tasted like hay. He loved how smooth it was and that it melted in your mouth. We were so happy to discover this new blue cheese. We’ll certainly keep our eye out for this one in the future! Now the true test, how do the Garnacha and Valdeon influence or enhance each other? I thought the wine smelled fruitier and fresh, with red berry flavors and no more spice. It definitely changed! It was hard to tell if the flavor of the cheese changed. There may have been more salt, less funk, and a hint of tartness. Neil thought the cheese got more tart and he didn’t like it in the pairing. He thought the wine changed the same way that I did and liked how the cheese influenced the wine. This wine was pretty good but the cheese stole the show. There was some of both leftover so we tried the pairing a second time about a week later and the funk of the cheese, really came out in the wine. I’m really glad we chose the theme of Spanish Wine and Cheese for our #winechat with Just the Bottle. Many of the wines that we pick for WineAndCheeseFriday come out of curiosity but it wasn’t until we added a Spanish cheese that we began to look forward to Spanish wines. We’ll be doing more Spanish pairings in the future and thanks to the chat, we have a few suggestions all ready to try.